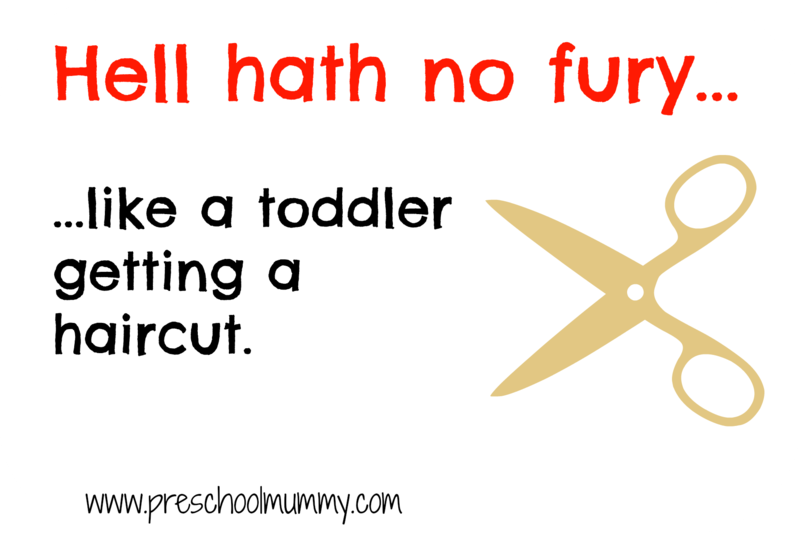 The necessary evil that is the toddler haircut. Haircut day is the bane of my existence. The stuff nightmares are made of, that humiliating (and deafening) experience involving a wailing toddler sitting atop my knees, his head spinning from side to side Exorcist style, his hands swatting away the stylist’s clippers, his mouth a sticky mess of Mentos and clumped together blonde baby hair. His baby sister sitting in her pram doing her best WTF face, his four year old brother repeatedly protesting against his own imminent haircut. Of course it’s always on a weekday morning so there’s always a couple of Ladies of Leisure having their perms set, peering disapprovingly over at the circus that is my life, which is disrupting their salon experience. All the while I’m guessing at their thoughts, probably along the lines of “That poor young mother, she mustn’t know how to stop having babies”. I fight the urge to tell them we’re just Catholic, and then silently congratulate myself that I’m not pregnant. Yet. It’s even got to the point where I’ve left about 12 weeks between trims and told Preschool Daddy we’re “growing Bug’s hair out” in a surfie, Elle-Macpherson’s-kid-kinda-way. Only that didn’t quite pan out. He ended up looking a little less celeb-bebe and a little more neglectaroony. Oh my God an atrocity has been done to me! A woman with scissors has cut off my golden blond locks and they’re now laying all over the floor of her shop. And now another one is sweeping them up! What the hell do you think you’re doing, lady? Where are you taking my beautiful hair??? You will pay for this! No babycino bribery can compensate my loss. My haircut’s not finished but I will now proceed to straighten my legs, slide out of my chair, flop to the floor and roll around trying to scoop up my wisps of hair before they’re gone forever. The hairdresser will refuse to continue. I’ll still have to pay. About $38 for the privilege ordeal. Not that I’m counting, or anything. Er, I don’t think so. After doing this crap for about a year, I discovered what my husband and I now affectionately call “a haircut in a box”, which I think could be one of the best reasons to visit Sunnybank (apart from the awesome Asian food, that is). You simply feed a $10 note into a machine, grab a ticket, get into the box and come out with a haircut. Okay, it’s not really a box, it’s a little tiny salon. The stylists are hairdressers and they’re good at what they do. They have screens showing retro cartoons to distract the children, and capes that look like superheroes’. The one we visit even has a seat shaped like a little Ferrari that the toddler can sit in while the hairdresser efficiently cuts his hair. $20 + twenty minutes = two happy, spunky little boys with stylish dos. Kerching! So go find somewhere that does cheapo (decent) haircuts and take a number. And after that, reward yourself with a cappuccino/stiff drink, mark the calendar for six weeks’ time, and enjoy every harmonious minute in the interim. LGM that’s so great that you held off for that long! Peppa is fab isn’t she? This sounds exactly like an experience I had recently. I live in fear of our next trip to the hairdressers. I’ve heard of those ones with the little car. Alas, I don’t think even that will help us!! Isn’t it dreadful!? Better luck next time! $10 haircuts where there is a seat shaped like a car are the best!!! So glad F can kind of get away with longish hair so there is a looooong time between cuts. Tried to convince him to get one before photos today but he flat out refused announcing ‘curls get the girls’! Thanks daddy…..
Oh how cute!!! What a little star! Very lucky indeed to have those golden curls and suit a long ‘do! Reminds me of one of my grandsons…now they do a number whatever with clippers at home , but even a promise of an Icecream doesn’t soften the crying. Hopefully he will outgrow this stage, and hopefully you’ll get the too. I’m not sure where you live but we had the exact same situation with coming across the little shop with the baby Ferrari! I dare say it’s a chain, but it was cheap, easy and friendly. My little one was 2 at the time – recently 3 he has totally overcome his haircut phobia as long as we go back to the ‘yellow car place’. Whoever patented that yellow Ferrari-seat-over-hairdresser chair thingy… I could hug!!! Hopefully when my little man turns three we will be out of the woods, too! Until Miss 8 months needs a haircut (I’m already thanking the universe she might just get away with long hair and mum trims!) thanks for visiting!! Daddy has been the ‘chopper’ / hairdresser of the house and luckily lil Miss 3 has always been happy to let Daddy trim her locks! Last year tho we did come across a hair salon where she could sit in a Big Red Car and have her haircut and she really enjoyed that. Looks like we are continuing the tradition with lil Miss 7 months having her haircut last week for the first time with Daddy! Great job Daddy!!! And also great job babies! What good little girls. I once tried to cut Bean’s hair and it was a disaster! It seems you have found a great solution to the haircutting problem. My solution is… I cut all my childrens and my husbands hair myself. I guess when they get older they will want to go elsewere but by then they will be able to sit still and injoy the treatment. My husband has beautiful curly hair but it is too hot for him so he lets me just give him a pretty short chut. I taught myself how to do it. My 8 year old girl and 5 year old boy have only been to a solan one time in thier life. Luckily they seemed to be fine and I felt comfortable but I know the feeling of having others look at you and you know they must be thinking ”poor thing doesn’t know about birth control.” More so now that I am pregnant again. Wow that’s awesome that you can cut their hair! Great skill to have and very economical! Hehe. I only get that feeling of judgement when everyone’s playing up. When they’re all behaving, it’s lovely compliments. But the burning stares when you’re juggling are awful! Juggling is a good word for it. So positive. I like that.